There are many things to do in Gent with kids (see our three-part series of articles on that starting here). However, if you are looking for a change of scenery, consider a day trip to Antwerp! 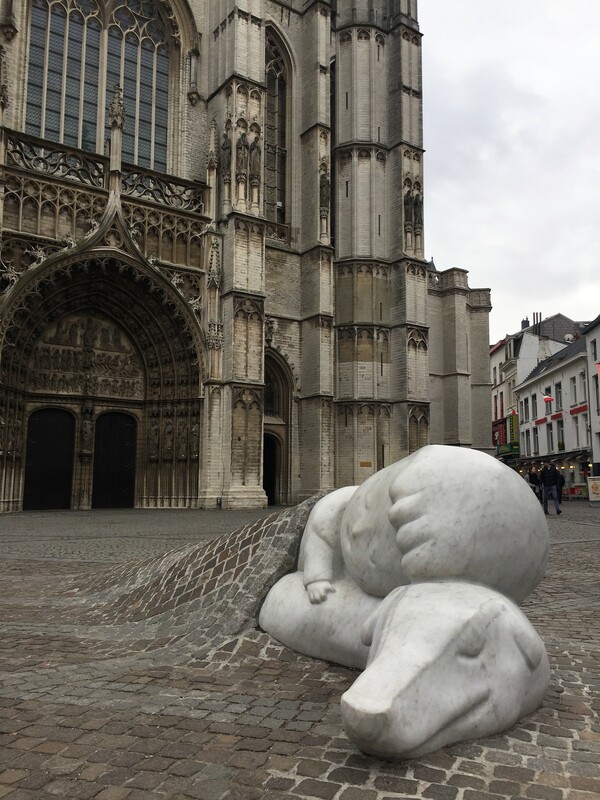 Here I will share some child-friendly things to do in Antwerp that I promise grown-ups will enjoy, too. 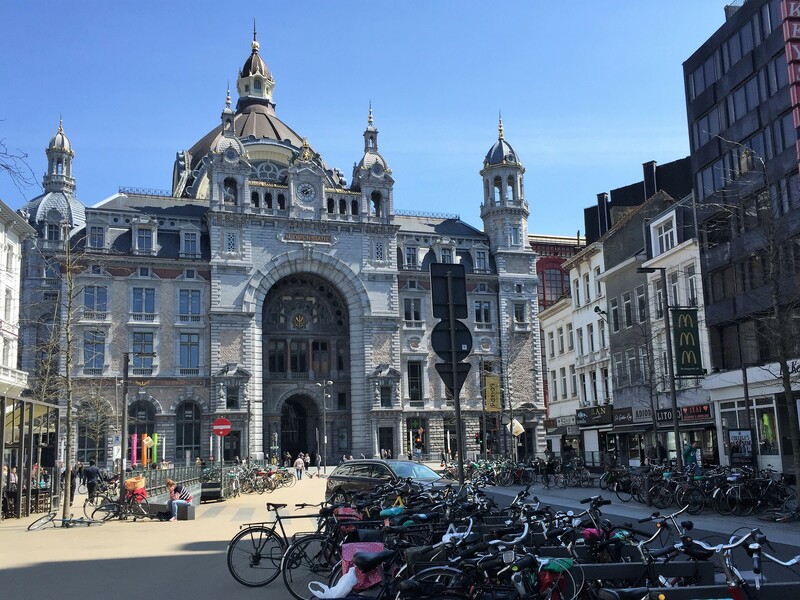 In reality, one day isn’t enough to do everything I suggest in this article, and there is so much more in Antwerp, so I hope you enjoy these tips while building an itinerary that is right for you. But first, some travel tips to make your visit easy and economical. 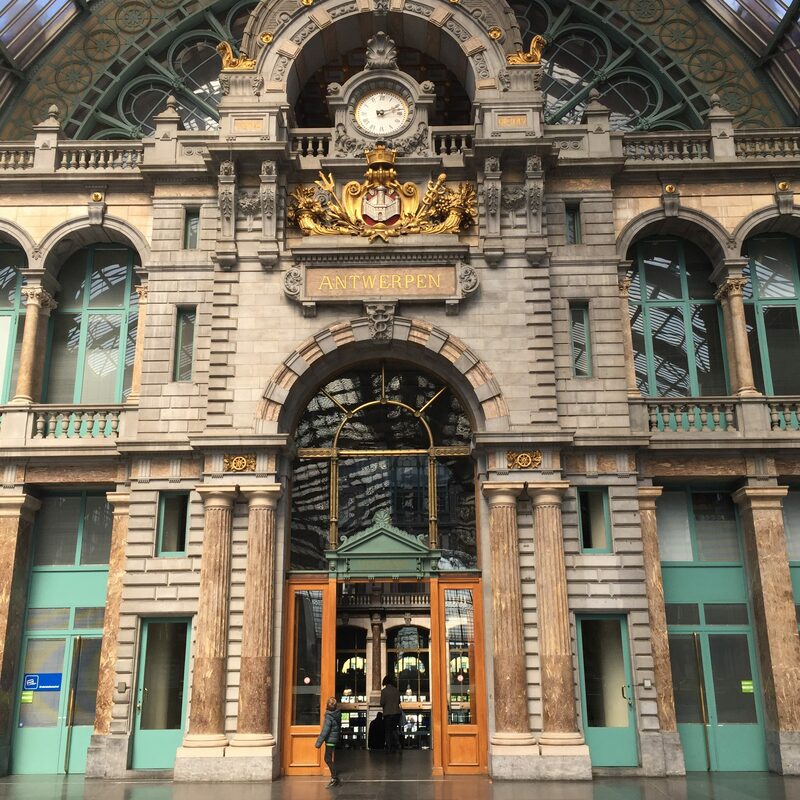 If you are going to be in Antwerp for 24-72 hours and plan on visiting a lot of the city’s attractions, the Antwerp City Card sold through the city’s Visitor Centers can save you some money. Check it out and see if it makes sense for you. Antwerp is about 60 km northeast of Gent and can be reached by car or train in about an hour. Belgian Rail offers B-Excursion tickets to two attractions I recommend, The Antwerp Zoo and Comics Station. B-Excursions include both your train ticket and your admission tickets to the attraction at a discounted rate. If you plan to visit either attraction and you are getting to Antwerp by train, take advantage of this deal! Some of the attractions I mention below are right next to each other, centered around the train station on the East side of the city. The rest are within about 2 km of the train station, to the west. Once in the city, it is all walkable, though some distances may be tiring on foot for younger travelers. 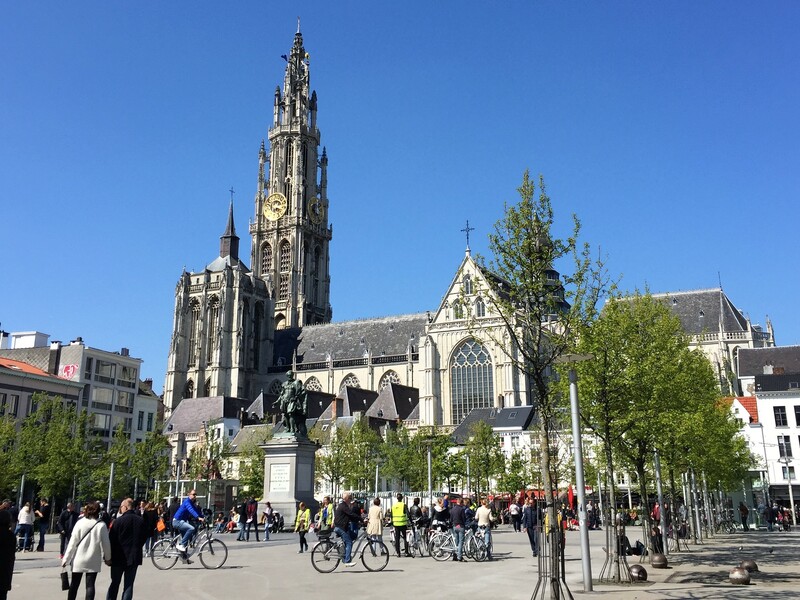 If you visit Antwerp by car, there are many public car parks and Park and Ride options to choose from. Be aware that in February 2017, Antwerp created a low-emission zone in the city center. Learn more here about conditions for entry in the low-emission zone, and requirements for registering a vehicle or purchasing a LEZ day pass. If you come by train or other public transport, De Lijn offers bus and tram services in Antwerp just like in Gent. In fact, if you have a De Lijn travel pass that you use in Gent, you can also use it in Antwerp. Use their route planner to determine the best way to get to and from your points of choosing. Even if you don’t arrive by train, the Antwerp Central Train Station can be a destination in its own right. Its beautiful architecture is hard to classify, combining neo-Baroque, Industrial, and Art Nouveau styles. Whatever it is, it is lovely and Instagram-able from almost every angle! Newsweek named Antwerp Central the fourth best train station in the world. Mashable named it the most beautiful. Enjoy the views from outside, inside the entrance hall, and inside the train hall. If your child enjoys trains, it is a great spot to see some come and go. Visitors of any age who love boats and ships can enjoy the Port of Antwerp. Old Port Cranes at the Port of Antwerp. The Visitor Center at the Port Pavilion is the best place to start a visit to the port. It is located at the base of the MAS Museum in the Eilandje neighborhood, at Hanzestedenplaats 19. Entrance is free and open from 9:30 to 17:30 every day except Monday. 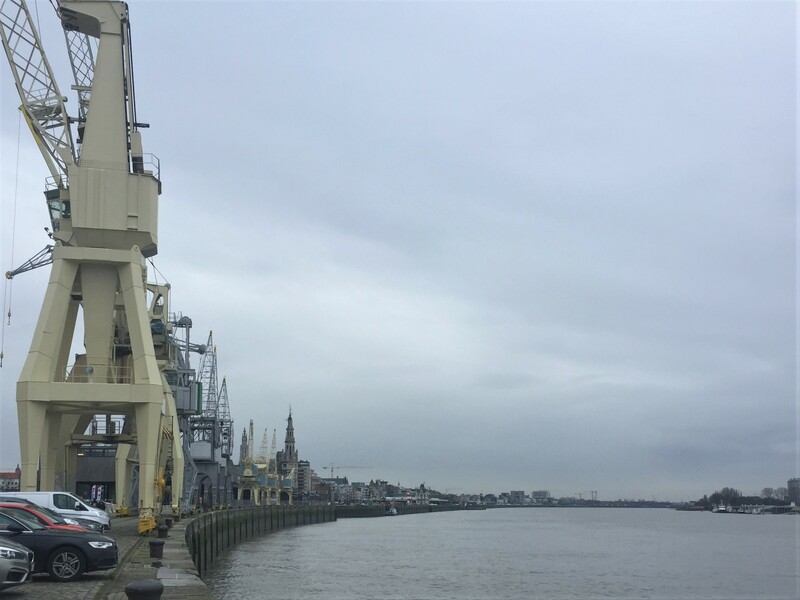 The Port of Antwerp is a deep-sea port, despite being 80km inland. It is the second largest port in Europe and is home to the Kieldrecht Lock, the largest sea lock in the world. At the Visitor Center and Port Pavilion (or on their website), you can learn more about the port and plan any number of the following activities: boat tours, ship spotting, fishing, cycling and walking trails, and photography. But you don’t even need to leave the Eilandje neighborhood to enjoy aspects of the port if you don’t want to. Consider sticking around and visiting the adjacent MAS Museum and Museum Dock. The Museum Aan de Stroom, or the MAS Museum, was co-founded by the Antwerp Port Authority in 2011. It sits where the city and the port meet, and weaves together the history of both. The museum boasts over 500,000 items presented thematically over five floors, as well as temporary exhibits. One floor is dedicated to the history of the port. Every floor offers views of either the city or the port, culminating with a 360 degree, panoramic view of both from the rooftop. The museum’s opening days and hours vary by time of year, so it is best to check here for current information. Children under 12 are free. Entrance to the boulevard and rooftop are also free and can be visited without visiting the museum exhibits. The museum has restaurants and cafes, or you can bring your own picnic, as picnicking is allowed on the boulevard and the rooftop (which again, you can access for free)! Outside the MAS Museum, the Museum Dock showcases museum ships, historical barges, and visiting historical sailing ships. Feeding time at the Antwerp Zoo. Originally built in 1843, the Antwerp Zoo is one of the oldest zoos in the world. It is conveniently located right next to the train station and is open 365 days a year. With 950 different species living in the 10.5 hectares (26 acre) zoo, you could easily spend the entire day there. If one day isn’t enough, or if you enjoy it so much you think you will return often, consider an annual membership for admission. Animals include primates, elephants, giraffes, zebras, hippopotamuses, penguins, lions and other large cats, bears, seals, butterflies, a bird building, a nocturnal animals building, an aquarium, and much more. Take note, the Aquatopia aquarium that used to be across the street from the zoo closed in January 2017. Many of the animals were relocated to the Antwerp Zoo. You may still see Aquatopia listed in guides as an attraction to visit, but since it is no longer open, enjoy the zoo’s aquarium while you are there! 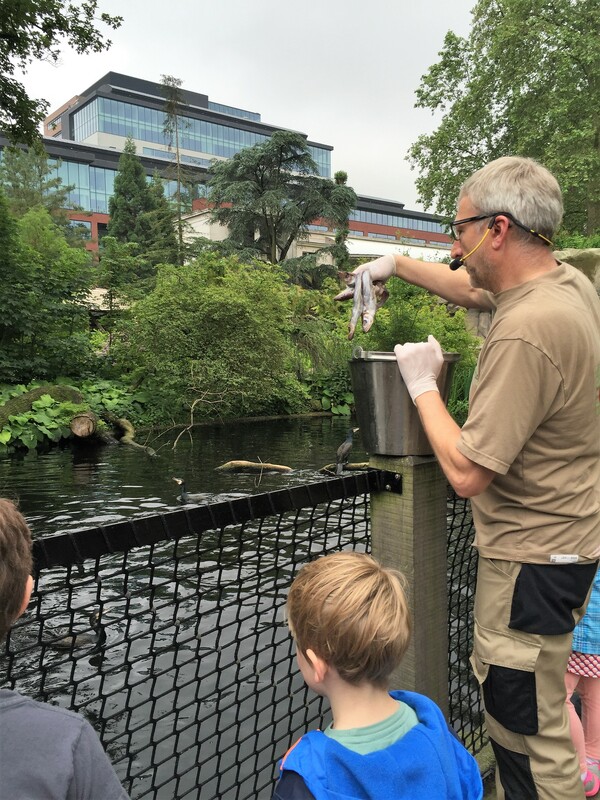 A daily program for zoo events and observable, interactive feeding times is available every day at the entrance, or online here. For your own feeding time while you are there, the zoo offers many dining options including cafes, restaurants, and food stands. In some areas picnicking is allowed. In the Handschoenmarkt, in front of the Cathedral of our Lady (Onze-Lieve-Vrouwekathedraal), you can find the statue of a boy and his dog, Nello and Patrasche. The two are the main characters in the classic children’s story, A Dog of Flanders, by British author Marie Louise de la Ramée (pen name Ouida). The story, written in 1872, is set in Flanders. Antwerp, the Cathedral, and the Peter Paul Rubens paintings within the Cathedral all play a role. The story was not translated into Dutch until the 1980s, so it has been relatively unknown in Flanders, though it has gained a tremendous following in Japan and South Korea and is regarded as a children’s classic. In 2016, a competition to design a statue of Nello and Patrasche was organized and supported by Buro BeroepsBelg tour guide Tanguy Ottomer, Friendship, Chow Tai Seng, and the city of Antwerp. The goal was to bring awareness of the story to Antwerp, the story’s home. The winning design was by Gent based artist, Batist Vermeulen (‘Tist’). The statue was unveiled in December 2016. It depicts the two characters displaying one of the overarching themes of the story – pure, unconditional, and everlasting friendship. Children familiar with the story may enjoy seeing Nello and Patrasche right where they belong, in Antwerp. Even without knowing the story, the design and the subjects are likely hard for children to resist. In the story, the characters are figuratively walked all over, though their spirit is never disturbed. Here, the statue can literally be walked over, climbed on, and played on by children, also without disturbance. Cathedral of our Lady (Onze-Lieve-Vrouwekathedraal). While a cathedral doesn’t really belong in the “for the ones who love animals” category, I mention it here due to its geographical proximity and contextual relevance to Nello and Patrasche. Visitors familiar with A Dog of Flanders may want to see the Cathedral and the Rubens paintings that are so prominently featured in the story. Others may want to visit the Cathedral for its own historical significance and beauty. The 16th century Cathedral of our Lady (Onze-Lieve-Vrouwekathedraal) is the city’s biggest church. Its stunning Gothic architecture and 123 m (400 ft.) high tower make it hard to miss. Its Belfry is listed along with all Belgian Belfries as a recognized UNESCO World Heritage Site. The Cathedral has visiting hours every day of the week, varying by day. There is an entrance fee, though children under 12 are free. The Cathedral is home to a large collection of art, including several works by Peter Paul Rubens (The Raising of the Cross, The Assumption of the Virgin, The Descent from the Cross, and The Resurrection of Christ). World’s highest indoor slide at Comics Station Antwerp. Comics Station Antwerp opened for business in April 2017. It is an indoor theme park featuring Belgium’s most popular comics characters. It is located at Antwerp Central Station on the side of the Kievitplein. Comics Station is open on Wednesdays from 12:00 to 17:00 and Saturday, Sunday, and holidays from 10:00 to 17:30. 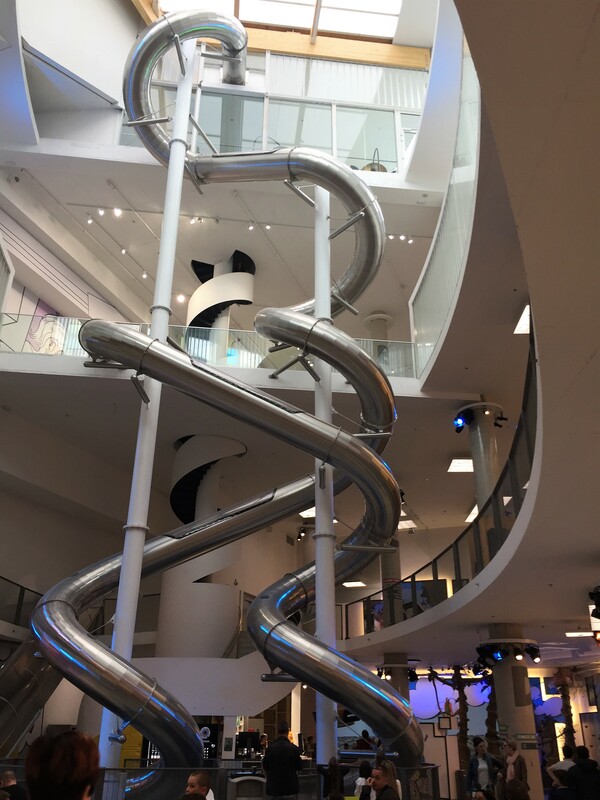 Comics Station has four floors of attractions that include rides, interactive games, an indoor playground, and three big slides, including the world’s highest indoor slide. There are three places to get drinks, snacks, or a full meal. Attractions are in sections by the comics characters. The park is generally recommended for children aged 2-12. Some attractions have motion and flashing lights and may not be appropriate for young children or adults with health issues. There is a small play area for younger children. Upon purchasing your ticket, you can indicate your preferred language (English, French, or Dutch), so many of the activities are presented to you in the language of your choosing. Most of the rides and interactive games are set up to be done in groups of four or five individuals, so this is a fun place for groups of children or families to play together. Lange Wapper statue at Het Steen Castle. Overlooking the Schelde River, Antwerp’s oldest building is Het Steen, a 13th Century castle. It has been a fortress, a prison, a museum, a sawmill, and a warehouse. Folklore tells us that two giants used to live in the castle, Druoon Antigoon and Lange Wapper. 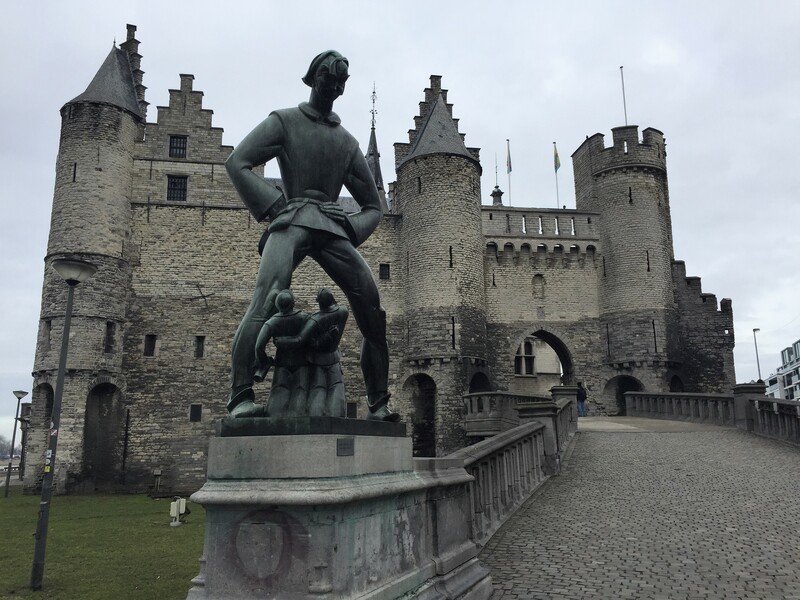 Lange Wapper can still be seen in statue form at the castle, taunting city residents, as he was said to enjoy. Legend has it that when Druoon Antigoon wanted to charge taxes for sailing on the Schelde, local hero Brabo cut off his hand and threw it away, or, in Dutch, hand werpen (hand throw), and thus, the city got its name. Het Steen is currently under renovation. When it reopens, it will serve as a welcome center for the city. For now, only exterior views can be enjoyed. Many of the attractions above have dining options available. If so, I tried to mention them in my descriptions. Here are a few more ideas for family-friendly eating. Affiliated with Het Palais, a performing arts center for children, Het Geluk is a child-friendly bar and café open Wednesday-Friday from 12:00 to 19:00 and Saturday and Sunday from 9:30 to 19:00. If you find yourself in Antwerp on Saturday, you can visit the Exotic Market (8:00 – 16:00). The market is filled with stalls selling international foods, produce, breads, cheeses, flowers, and more. It’s a great place to pass through when you need a snack or meal. 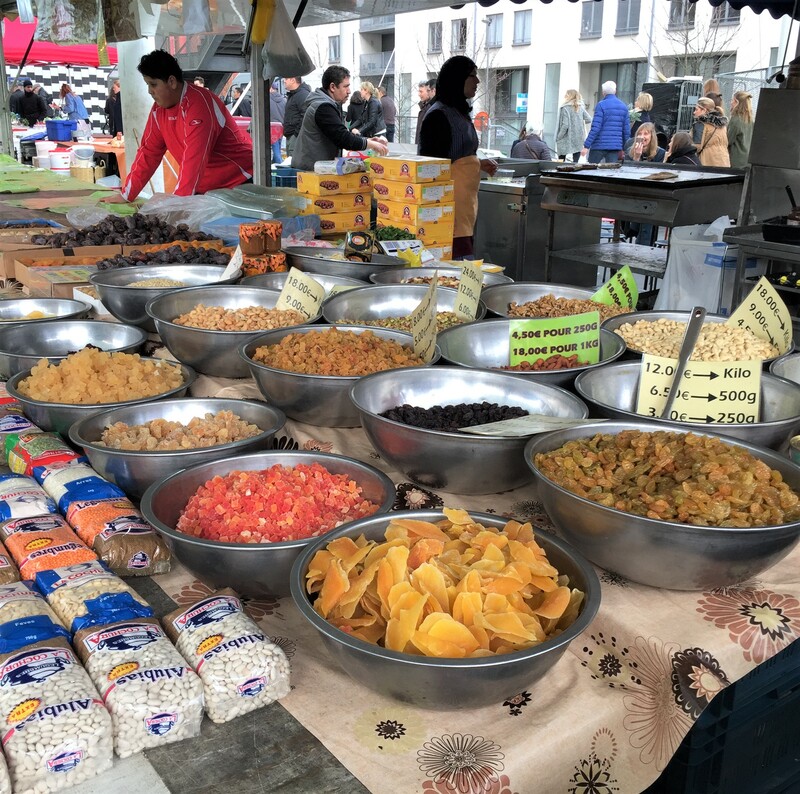 If it isn’t Saturday but you like the idea of going to a market, you can find a list of all of Antwerp’s markets here. Okay, this one is not quite in the center of Antwerp, but for me, no trip to Antwerp is complete without a stop here. This is the closest American food store to Gent (that I know of). For some expats, it might be worth the trip to Antwerp for this alone! The Graré American Food Store carries North American food from the United States and Mexico. The store has opening hours on Thursday through Sunday. If you are craving American peanut butter, Jell-O, refried beans, RO-TEL, or other North American specialties, this is the place to go. It’s always a fun trip for my son, because he sure does miss Pop-Tarts! It would take more than one day trip to adequately visit everything I have listed here. I hope you enjoy creating your own kid-friendly day trip to Antwerp with these suggestions. Let us know your favorite kid-friendly thing to do in Antwerp, or if there is something I missed. Enjoy your trip!